If you are at all squeamish, scared of flying (there is a section on how cadavers can help people work out what went wrong in plane crashes. That I read just before getting on a plane, haha), or if the thought of anything to do with dead bodies makes you feel uncomfortable, then DO NOT GO ANYWHERE NEAR THIS BOOK. If like me, however, you have a bit of a morbid side anyway, and are fascinated by anything to do with the human body, then this book is amazing! Mary Roach writes in a really interesting way – although she is obviously taking everything seriously, she is also not afraid to laugh at the more ridiculous aspects of the subjects she is covering and the people she talks to, and it makes the whole book both fascinating and really entertaining. 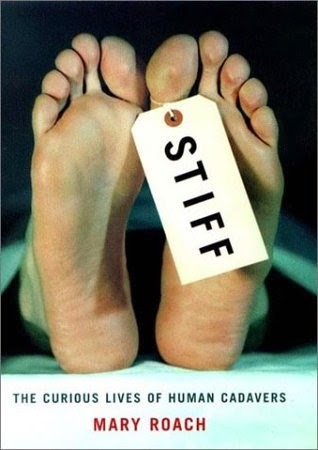 Even though the subject matter theoretically doesn’t bother me, I did find myself fluctuating between laughter and cringing in disgust while reading it, and I had to put it down a few times as it all got a bit much, I still really recommend it, if finding out a lot about what can happen to people's bodies after they die sounds interesting. I’m really glad that I got in on my kindle on a whim while I was at the airport waiting for an 11 hour flight after finding myself unable to concentrate on any of the other books I had bought with me. I am currently in the middle of reading Packing For Mars which is also by Mary Roach, and is also fascinating and keeps on making me laugh. One caveat to this recommendation maybe is that the book is a bit old, so the information in it may well have been proved to be wrong in the meantime (as happens so often with science), and some of the things that she talks about may have ceased to exist since it was published, but that didn’t really bother me personally. 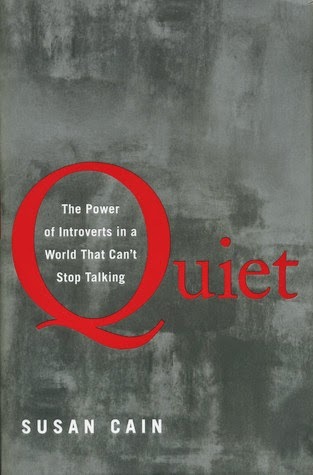 After reading this book, I think I can say with some confidence that I definitely have introvert tendencies. I’m not sure that I come off like this to people I know (I tried talking to my mum about it and she said “You?! An introvert?! Pfft!”), but some of the stuff that was written in this book about how introverts and extroverts differ really made sense to me, and reading it made me realise that not wanting to go out with friends every night was not some sort of failing on my part, and the fact that I need wind down time after spending time with other people isn’t just me being weird, it’s quite a common thing! I did feel like the book was slightly too harsh on extroverts (by constantly talking about how great introverts are at various things, it seemed to imply that extroverts couldn’t be good at them. I’m not entirely sure that that was the author’s intention, but that is how it came off! ), and actually made me feel a bit worse about myself in some parts, as although I would probably mostly identify as an introvert, I’m not sure that that means that I am in possession of all of the amazing qualities that the Susan Cains talks about introverts having. I also think that it was a little bit too long, I think that I might have been happier just reading an essay about it rather than a whole book. This was actually one of the first books that I bought for my kindle, but it took me almost a year to actually finish it, which is partly because my kindle was telling me that I had loads left when in fact it was mostly endnotes, and because after a certain point I wasn’t sure what more I could get out of reading the rest, although when I actually came back to the book about 11 months after unintentionally not finishing it, I only had one chapter left! This is turning into a much longer series of posts than I had intended. I think I've been reading too much, haha. Only one more (maybe?) to go though. Woohoo! I've read a loooot of reviews of Quiet where people have been like 'she is pretty mean to extroverts though' and I don't really remember it like that at all! But the thing is, I feel like she felt the need to really emphasise the introvert traits, because they're ones that aren't at all valued by the world and actually, you know, they have their advantages too! I completely get that, and I'm glad that somebody has done it... but it would have been better if she had maybe done it in a more balanced way? I get that that would be extremely difficult to do though. To be honest, I had read reviews beforehand (or possibly while I was taking a break from reading it!) saying that it was a bit unfair to extroverts, so that made me notice it every time that she was. It just made me wish that I had all of the good things about being an introvert, as I'm not sure I have any, but I definitely fall on the introvert side. It just seems to manifest itself in social awkwardness and needing time by myself, rather than making me more observant or anything like that. Boo! Hehe.